I totally called the Shyamalan Plot Twist at least a minute ahead. There were some scary parts -- I am a big wimp and was definitely watching through my fingers -- and the kids have a very satisfying success after the big reveal. But the ending was terrible. Like Deathly Hallows epilogue terrible. I hope the boy was paid a lot of money for his terrible rap stylings which will surely follow him through middle school like a bad smell. Planet Money just did a piece on the producer, Jason Blum, and his company, Blumhouse, which produces these low-budget horror films, and, in general, I like them. I liked this one -- it's the first Shyamalan film I have wanted to see in a while. I watched it mostly as a comedy, and enjoyed it as a comedy, but I thought the big reveal about the grandparents was perfect. But, much as I enjoyed the film, I still was uncomfortable that it demonized mental illness. Worse still, it felt lazy in doing so. It could have been a perfectly enjoyable folie à deux without the mental illness aspect. I guess I just don't like it when the mentally ill, who are more typically victims than victimizers, are painted this way. I had the same reaction, maxsparber. That (and getting too tense from jump scares) are why I am currently in the lobby of the theater while my boyfriend is finishing the film. Yeah, the twist felt lazy and exploitative to me too. Like, "Who would do this? A crazy person! Or even better, two crazy people! Plot problems sorted." I thought it was good. Scary and funny at the same time. Definitely demonizing mental illness more than anything needs to, as well as the elderly to a degree. But it's a horror movie so I gotta figure something is gonna get demonized. I was pretty disappointed by the conceit that this was the documentary the girl filmed and edited himself. Aside from being totally played out, it felt like a half-idea that wasn't adhered to very well. Aside from the "mentally ill people are inherently dangerous and make good scary villains" aspect, my main complaint about this concerns minor moments of obnoxiousness from the two kids (rapping, precociously spouting off about textbook filmmaking techniques), but I got used to those things and didn't find them overwhelming. Overall I thought the kid actors did a good job, the things that bugged me were totally in the writing. And both of the actors playing the "grandparents" were phenomenal. I don't think I've seen the Nana actress before, but I recognized Pop-Pop as a recurring judge on Law & Order and Michael, Michael and David's landlord in one episode of Stella. Given this much screentime, I started noticing a physical resemblance to Dennis Hopper...Which certainly helped. I also knew the twist going in...I looked for it online because I had a theory about it from watching the trailer, and before I heard that the movie wasn't horrible (that is, before I decided that I actually wanted to see it), I was more invested in confirming my theory than in finding out from watching the movie. My theory was that it was going to be a witchcraft body-switching thing, where the grandparents were going to try to possess the kids so they could live on in their young bodies (basically the same twist as a couple of other movies/stories that I could name here, but don't want to spoil them). As problematic as the actual twist turned out to be, I'm at least glad that I didn't call it immediately just from a 2.5 minute trailer. I liked it. A lot, in fact. I thought that (even including the rapping) both teen leads did a good job at creating likable characters. Both adult leads did a great job creating unnerving villains. The teases at the supernatural were well done, the twist was appropriate, the scary parts were very tense, and the slow build mixed with black comedy was enjoyable. It was well shot, and the found footage aspect being framed as a precocious child's effort to create an award winning documentary was both a clever wink, and a good way to get non-vomitous cinematography out of the genre. M. Night did a great job with this one. 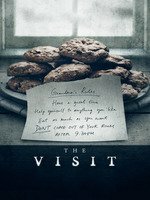 I enjoyed it - it was a quiet little scary movie, with little moments instead of big crazy supernatural FX. I thought the acting was really well done, and the 'twist' was appropriate for the movie. Late to the party, but I just saw this movie yesterday. I liked everything up until the twist (which I didn't see coming and was satisfactorily creeped out by). I've had one grandparent slowly succumb to Alzheimer when I was the same age as these kids, and it oftentimes really was eerie and scary. So I thought it was a brilliant idea to use that for creeping horror, together with the helplessness of children when dealing with erratic behaviour by grown-ups. And then, starting from the reveal in the basement, everything went downhill like a speed skier. Mental illness as the sole motivation for the baddies, really? And isn't that whole slender-female-figure-crawling-on-all-fours-with-long-hair-obscuring-her-face thing a huge horror trope by now? (Genuinely asking; I almost never watch horror, but that still seemed way too familiar.) And surely the creepy hand reaching from underneath the bed - I mean I get that this was probably an allusion to typical kids' fears, but the effect was rather comical. And the diaper? That was just, ew. I liked the final rap though. I figured it was meant to be goofy. That diaper part probably disturbed me and my friends more than anything else in the entire movie. I felt that this was a movie where Shyamalan was trying to reduce a lot of things to basics and it felt like a really personal film for him. The running commentary on filmmaking, and hitting upon the idea of growing up and older. I felt the major underlying theme was abuse, the different forms that could take, and the effects that could produce. Even abandonment is a form of abuse that really isn't recognized as much as it should be. The reused tropes seemed to be a kind of cover up to give a supernatural air instead of giving away the obvious culprit of mental illness. I didn't really appreciate the use of mental illness, but I felt that these were really Shyamalan's fears and insecurities blown up and projected. Even though I could see most of the scares coming a long way away and was able to recognize all the little details that built the tension, I still felt the tension. Which I liked about the film, but the writing was...eh. I also feel it's really kind of reductionist whenever Shyamalan's name comes up "the twist" is brought up, when really "the reveal" is such a common convention and has been in use for a long time and he uses it to great effect. After giving it a day of thought, I feel this movie is simply about abuse seen throug the eyes of a child. The misunderstanding of, the unknown terror in, and the search for normalcy in adults who perpetrate abuse. The attempts at trying to show "this is how normal kids play." Aside from all the killing, and the cathartic happy ending, there was a lot in this film that hewed pretty close to personal experience. Every time I see a Shyamalan film there's something interesting about it, whether or not I think it's good. I'm not sure this film was good. I thought it dragged in a lot of places. Still there are interesting things about it and it had a way of keeping me watching even if I was wondering at times why I was watching. First, I'll say I think P.o.B. is right. This does seem to be about personal experience, growing up and making sense of behaviour in adults that you're relying on to be rational when they very often aren't capable of rationality all the time. Maybe because of psychosis, as in this film, but maybe because parents and grandparents are people, and people aren't rational. And adults being everyday levels of irrational isn't cinematic enough to bother with, so they had to take it to extremes. Again, people are talking about "the twist" or "the reveal" and I also agree that it's reductionist. In this case "the twist" is that things are more or less as they appear - the grandparents are severely mentally ill in ways that can't just be chalked up to ageing. Are we going to say The Twist is that the real grandparents are dead in the basement? I really don't think it is, because they telegraphed that something incriminating is in the basement with the Chekhov's Mold prohibition right at the start. Much as it might seem clumsy to have murder victims in the basement shock horror, you only have to think about it for two seconds to realize that that's what losing relatives to dementia is like: that Grandma and Pop Pop have been killed and replaced by impostors who look like them but act in ways that terrify and disturb you. So the twist is that there is no twist: the kids keep trying to go along with the mundane explanations for this bizarre behaviour, and it's more horrifying than they imagined, and yet the explanation still is mundane. I feel like every horror movie I've watched over the last couple of years has really been about untreated mental illness and not at all about supernatural phenomena, and this movie just strips that down to its bare essentials. What I do feel like is that the sensationalism was kind of just sprinkled here and there and they almost needed more of it and that's why the whole thing feels off balance. Considering what Shyamalan seems to have been getting at, I don't think he had any choice but to have the grandparents dead in the basement, but it doesn't feel like he pulled it off quite right. I feel like with a bit of restructuring it could have worked better than it did. And you have Grandma constantly baking everything but gingerbread, and you have her telling Gretel to get in the oven. You have the mom, a Wal-mart employee earning less than $10 an hour, being taken on an expensive cruise by a handsome prince. And then the rug gets pulled out from under that at the end of the vacation, where they fall out because Prince Charming is putting on weight. It is somehow more reassuring that Mom isn't desperate to latch onto a good provider, I think. And the usual thing that happens in movies like this (I'm thinking Oculus) is that it's impossible to get through to adult forces that could rescue you. But in the end Mom actually does arrive, with the full US Cavalry to boot. So that's two subversions of common tropes or fairy tales. As for the patient/friend getting hanged in the front yard: come on. That part really does feed into the "demonization of mental illness" thing in a way that can't be excused (and note the red riding hoodie she's wearing). And not only that but if you've read The Silence of the Lambs you know it's unfeasible just to string a person up like that. Plus, these people seem to be physically fit for their age, but how would they even lift her?!? Also, also. There are two characters that seem to pop up for the sole purpose of telling us they're actors, and letting them do a little monologue. I wonder if that's literally why they're there - like Shyamalan was giving them a boost, or something. So those are my first impressions, anyway.